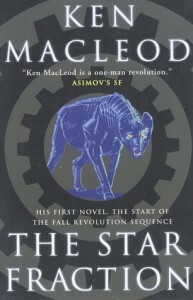 Ken Macleod's first book was 1995's “The Star Fraction”. It is set in a mid-21st Century Britain that has broken up into dozens of tiny mini-states, all with radically different ideologies – from anarchists to fundamentalist Christians – all ruled over by an absentee monarchy and the United Nations military. The main character is Moh Khan, a former political activist for a socialist political group now working as a lowly Security Guard-for-hire guarding a science laboratory. After a raid on the laboratory he meets up with Janis Taine, a scientist on the run from the UN and, later, Jordan Brown, a teenage refugee trying to escape from his life in a fundamentalist enclave. The central technological concept is the development of a conscious Artificial Intelligence, which could gain some measure of control over the networked computers on which the world depends. As the book wears on Moh realises that this rogue AI is the culmination of a program his father was writing for a revolutionary group dedicated to bring down the current status quo of world politics. The plot is complicated to summarise, and also complicated to follow whilst reading the book. MacLeod drops the reader into the middle of the story and uses only a minimal amount of exposition which means that some thought is required to understand what is going on. By the end of the book it does all make sense, but people looking for a quick read may want to look elsewhere. The writing style is rarely straightforward either, with Ken throwing in unusual sentence construction and obscure cultural references. The overall effect works very well, the writing seems fresh and original while still being comprehensible, although the innovative use of language makes it even less of a quick read. There are even a few subtle but often amusing jokes thrown in. MacLeod has an in-depth knowledge of some of the more unusual political ideologies (such as libertarianism or communism) and several of them appear here, with either the societies or the character's motivations often being based on one or other of the political movements. People without knowledge of the ideologies might miss out on some of the references, but it offers an interesting viewpoint on possible ways of life that differ radically from the current British society. MacLeod refuses to endorse or condemn most of the viewpoints (although he’s obviously not keen on the religious fundamentalism of Jordan’s home); instead the reader is presumably being left to draw their own conclusions. The focus on the effects of futuristic computing technology and political ideology could easily have lead to a dull book but MacLeod's writing makes it all highly entertaining, as well as being interesting. The characterisation is fairly good, although nothing special, and the dialogue is as well written as the rest of the prose. In summary, this is a well-written, entertaining book with more ideas than a dozen lesser science fiction novels.